Autobiography of God's work in Christiana Tsai's Life in China. "My bed is not a prison, but a training school; the Holy Spirit is my mentor, and my visitors are my homework." Because the Spirit of God breathes through its pages, this book is highly recommended to Christian readers everywhere. The author has made us feel the heartbeat of a nation and has done much to interpret the sufficiency of Christ to a great and needy people. In her furnace of affliction, Miss Tsai has discovered the secret of spiritual refining. In her dark chamber of infirmity, she has found the Light of the World. This book is a combination of her three books that were published earlier. 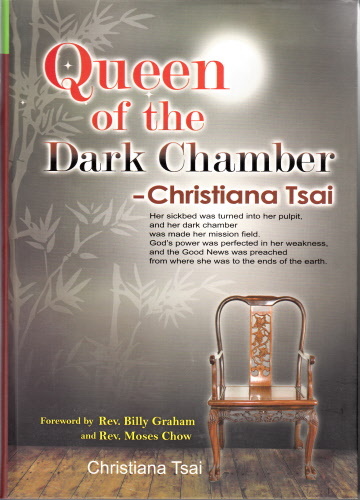 It includes Queen of the Dark Chamber, Christiana Tsai, and the Jewels from the Queen of the Dark Chamber; all written by Christian Tsai herself.